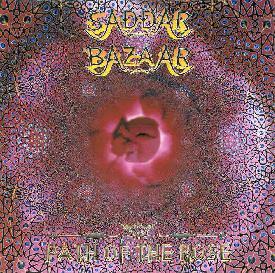 Saddar Bazaar - "Path of the Rose"
From Bristol, UK comes this Eastern-psychedelic quartet Saddar Bazaar, though I wouldn't be surprised if the lead duo, the Hyder brothers Shaun (sitar) and Rehar (guitar), were really from Pakistan where the actual Bazaar exists. Because this is very nearly 'true' Eastern music, complete with instruments I'd never heard of...such as a dholak (Indian hand drum) and a tambura (Asian lute). So it surprises me to learn that these Bristol lads recorded a track with Texas doom metal-heads Solitude Aeturnus, the entity that also spawned the excellent psychedelic trio the Liquid Sound Company. Hmmm.... perhaps that meeting even led to the inspiration for LSC's formation? "Path of the Rose" wanders through 10 tracks of similar length, amounting to a 45-minute oriental journey. Tablas and sitar abound throughout, although a number of tunes have a western pop flavor (á la the Beatles) with the melodies carried by various instruments, usually sitar and slide guitar from the Hyders or moogy organ from Terry Banx. "Arabesque" (sic) in fact sounds a bit like "Norwegian Wood" though the melody is built atop a mindnumbing drone created by some unknown instrument, probably something that relies on a rosin wheel and a crank (my ignorance is showing). The followup, "Painted Dust," is a pretty, ambient piece that sprinkles a simple sitar melody and light acoustic guitar work atop the hovering synth tones. "Peacock Angel" then comes across with a little more urgency with sitar/guitar drone and multiple percussion tracks from Dave Spencer, and features an excellent flute solo by guest Tainenska Royal. This is the sort of frosting the group really needs to exploit more. The remaining tracks explore very similar themes, and are a bit anti-climactic even. The lone major drawback of "Path of the Rose" is the lack of vocals... nothing wrong with instrumentals, but many of these tracks seem to be set up for verses and choruses - or at least I can imagine them in my head. Which means the music seems to be missing a dimension. Still, by listening to the Bazaar, you'll take one more step towards appreciation of true Eastern music past what one would get by simply listening to the Ozrics or Steve Hillage's "L." And the cover art is too cool to pass up.